Wonderful Flemish painter, draftsman and engraver Antonis Van Dyke became one of the creators of the genre of the ceremonial portrait of the XVII century. The influence of his work on the art of the European portrait was felt for three centuries. The decisive role in the formation of Van Dyck as an artist was played by P. Rubens, in whose workshop he worked in 1618-1620. In 1620 the artist visited England and then went to Italy, where his attention was attracted by the painting of Titian. Upon his return from Italy, in 1627-1632, Van Dyke became the first artist of Flanders. He was appointed one of the court painters of the Spanish governor Isabella. In 1632 the artist went to England, where he became a court painter of Charles I – a patron and collector, who had brilliant taste and intuition. In England, high society considered it an honor to pose as an artist. The art of Van Dyke conquered the English, in fact, associated with the artist’s name the beginning of the English school portrait. His portraits are poetic and refined, spiritualized, full of imagination and fantasy and at the same time filled with deep comprehension of individuality of personality. Among the outstanding works belongs a portrait of “Charles I, King of England, on the hunt.” The monarch is depicted in a relaxed atmosphere. Its appearance is elegant, aristocratic, charming and refined. Other famous works: “Iconography”; “Family Portrait” 1621. The Hermitage, St. Petersburg. 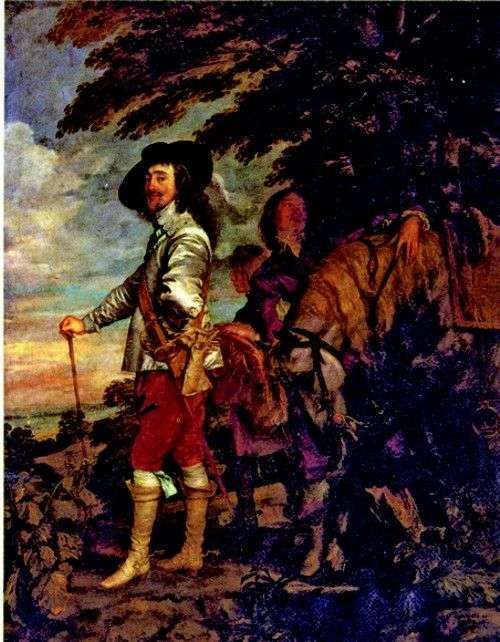 Description and meaning of the painting Charles I, King of England, on the hunt by Anthony Van Dyck.